BRISTOL SHOW: Q Acoustics reveals prototype QTV-2 TV speaker system | What Hi-Fi? What lay within is the prototype of the company's forthcoming QTV-2 2.1 sub/sat speaker system, not on show to the public here at the Bristol Show. So what's so special, you may ask? After all, sub/sat systems are two-a-penny these days. Well, yes, but this one's a little bit different – and rather clever. In essence it consists of a flat panel that slots on to the back of any 32-42in flatscreen TV, and from which sprouts on either side a satellite speaker. The clever part is that the back panel is in fact a subwoofer with built-in amp and two pairs of drive units down each side, yet the whole thing is just 38mm deep. 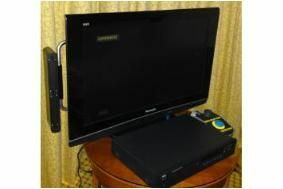 It can be mounted on the back of the TV using its own bracket, and if you want to wall-mount your telly then an optional wall-mounting or cantilever kit is available for an extra £50. The two satellite speakers each contain a pair of BMR drive units, and can be swivelled if required. Designed as an instant 'plug-and-play' system to boost a TV's sound, the QTV-2 is expected to retail for around £299 when it goes on sale in the third quarter of this year. The unit will be equipped with a conventional phono line-in socket, an optical digital input, an Aux input for an iPod and a 3.5mm headphone jack. You can then connect it to the TV's headphone socket, phono out or optical out, and hook in an external source such as a DVD player if required. There's also a built-in digital delay function to cope with lip-synch problems. And if you're wondering what the big blue button in the picture is, that's not part of the standard spec, but just a switch used in the demo for flicking between the TV's normal sound and that of the QTV-2.